Thanks to the methods used in musical iconography, this study will seek to better define the place and importance of music in the architecture of the Palace of Versailles under the Ancien Régime and to question the musical inspiration within court life in this era. 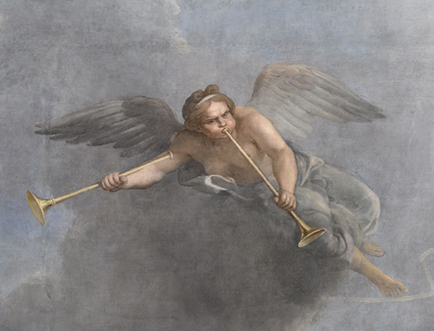 This programme will explore the representation of music in the interior, painted and sculpted architectural decor still in place at the Palace of Versailles: ceilings, wall decorations and woodwork. It shall follow three successive stages: an inventory of the decors, their classification and analysis, and an interpretation of the results. The inventory will be conducted in situ through the systematic identification of all musical elements present in the palace’s decor, room by room, starting with the State apartments, the private chambers and the bedchambers. It will continue with the chapel, the opera house, and the private apartments. The data collected will be catalogued and documented from a historic and artist perspective and will undergo an initial musical study – using organology as well as musical myths and symbols – which will draw on specialised thesauri used internationally in this field. This referencing will be accompanied by a selective bibliography. The analysis and interpretation of the results of this study will then be discussed at IReMUS seminars, one of which will be dedicated to this topic (with two or three papers). Furthermore, the exhaustive inventory of works studied and several articles on subjects to be defined according to the results will be featured in a special edition dedicated to musical iconography at Versailles (in the journal Musique • Images• Instruments, the Bulletin du Centre de recherche du château de Versailles et Versalia). Lastly, the data, catalogued in an Excel file, could be incorporated into the IReMus’ specialised musical iconography database: Euterpe, la musique en images. Programme coordinated by the CCentre de recherche du château de Versailles and the Institut de Recherche en Musicologie (IReMus – UMR 8223).